My oldest daughter is going through a growth spurt. All of a sudden all of her clothes are too small. I took a quick trip to the store(s) to buy her some new clothes. I had one skirt in my hand that looked really cute. I cannot remember the cost, but I do know it was way too much for what I was getting. 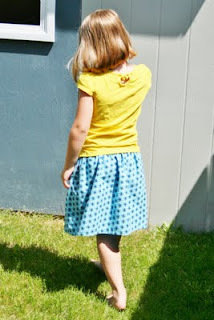 It was a very simple skirt with an elastic waistband. I had no plans on making her one, but at the same time I knew I couldn't pay for it knowing that I could make one. A few days later I was at my favourite hangout, the fabric store, and I saw this fabric while I was at the cutting table. I made a quick decision and purchased it. I knew my girl would love it, it is her favourite colour! I had no real plans to make the skirt, but today while I should have been cleaning and organizing I thought that sewing would be more fun, so I did it. 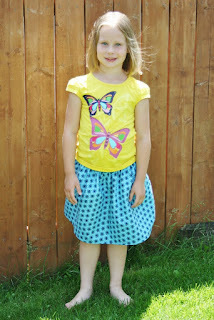 Here is my Lucy Skirt modeled by my daughter.